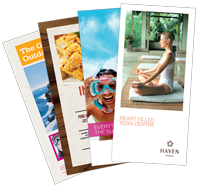 We have created folding templates for some common brochure sizes. Please feel free to download any of them to assist you in setting up your page layout files. And if you have any questions or need a different template, call one of our pre-press technicians — they'll be glad to help you!